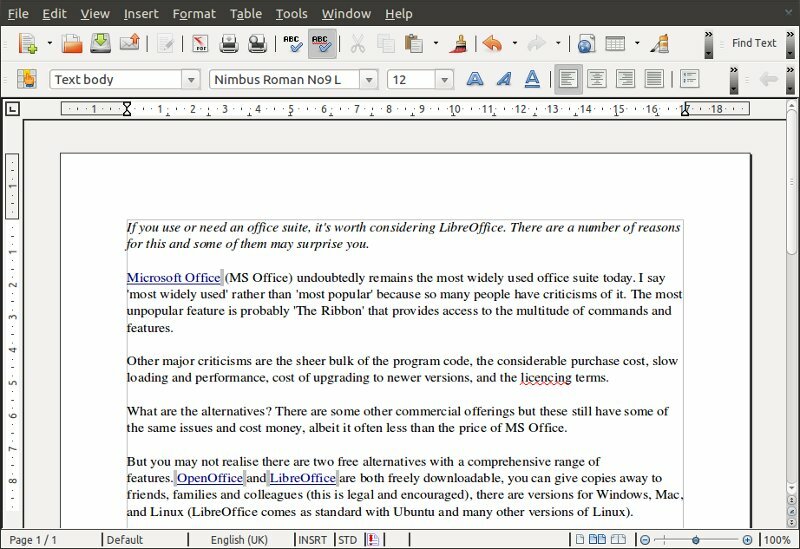 If you use or need an office suite, it's worth considering LibreOffice. There are a number of reasons for this and some of them may surprise you. Microsoft Office (MS Office) undoubtedly remains the most widely used office suite today. I say 'most widely used' rather than 'most popular' because so many people have criticisms of it. The most unpopular feature is probably 'The Ribbon' that provides access to the multitude of commands and features. Other major criticisms are the sheer bulk of the program code, the considerable purchase cost, slow loading and performance, cost of upgrading to newer versions, and the licencing terms. What are the alternatives? There are some other commercial offerings but these still have some of the same issues and do cost money, albeit it often less than the price of MS Office. But you may not realise there are two free alternatives with a comprehensive range of features. OpenOffice and LibreOffice are both freely downloadable, you can give copies away to friends, families and colleagues (this is legal and encouraged), there are versions for Windows, Mac, and Linux (LibreOffice comes as standard with Ubuntu and many other versions of Linux). OpenOffice and LibreOffice have a common history but LibreOffice is beginning to look like the front runner. Check out Google's list of review articles on LibreOffice. 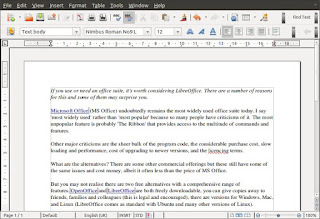 I strongly urge you to give LibreOffice a try. It's free, so what have you got to lose? It contains everything you need - word processor, spreadsheet, business presentation, graphics, maths editor, and database. All are built to professional standards, can load and save in a range of file types (including MS Office formats), can save PDFs, are regularly updated and upgrades are, of course, free. If you need more information, take a peek at the manuals and user guides (you might like to start with the introduction).